I had a great night last night at the MRC Battle of the Bands (check out this link if you want to see a news story done on the event). But, right now, that’s not what’s on my mind. Since I got home last night around 10, all I’ve been focused on is sinking into my couch and lounging around my house. So that’s what I’m gonna write about! That’s right. It’s banana, almond frozen goodness. This is gonna sound weird, but frozen bananas are amazing. 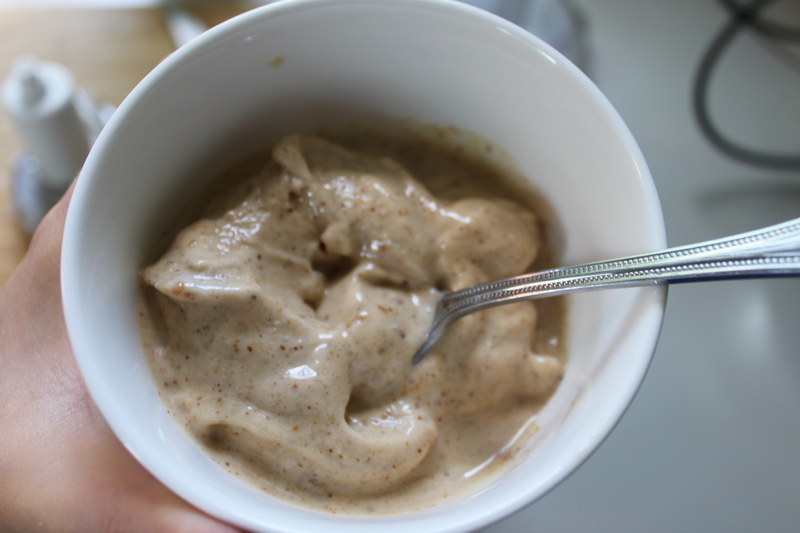 A few years ago, I discovered that frozen bananas are the trick to good smoothies (because the banana’s frozen, it acts as a built in ice cube, so you get a cold, thick froth instead of bits and chunks of ice that ultimately water down the flavor). I even talked about frozen bananas in my Green Monster post. But, this frozen banana recipe might top them all. I saw Claire Robinson make this peanut butter and banana ice cream (link lets you check out the full video of her making it). So I decided to give it a try this morning. 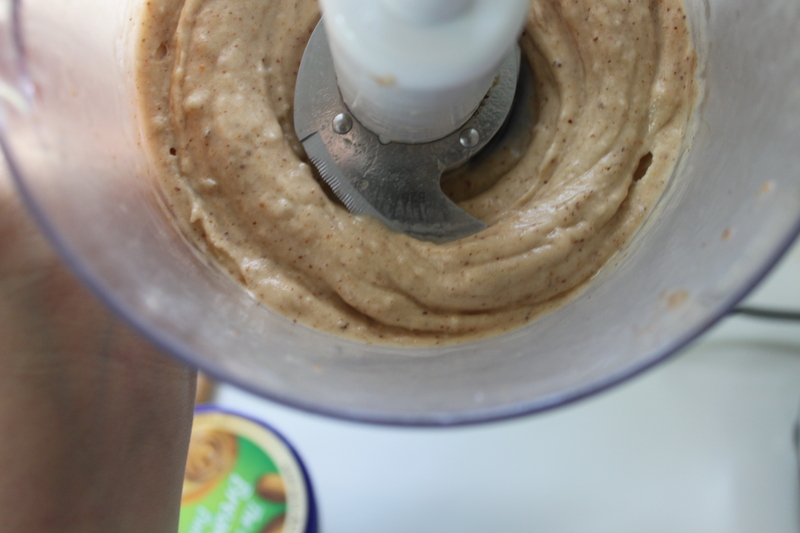 She only uses peanut butter and banana but I substituted almond butter for peanut butter, and I used a splash of almond milk to thin it out (I found it wasn’t mixing enough in the food processor). Here’s what it looked like after I added a little milk. It’s like eating ice cream for breakfast but in reality it’s a really healthy, protein packed breakfast. The only problem might be when you scarf it down in under a minute and want another! We also finally put up some curtains! Remember me complaining about needing a little extra something in our our living room? Well, I finally decided to do some DIY curtains that I found instructions for here on younghouselove. 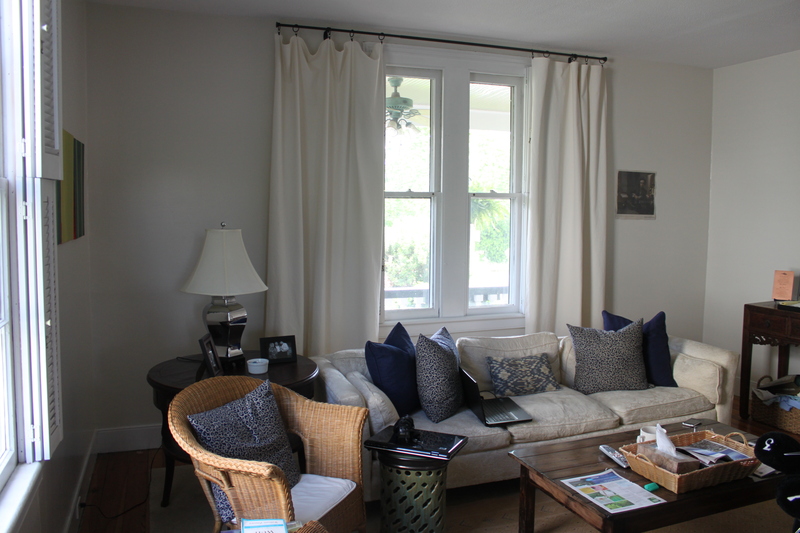 I pondered different patterns, but I ultimately realized that the curtains in almost all of my inspiration pics were white (and most of the pics had white walls, too). 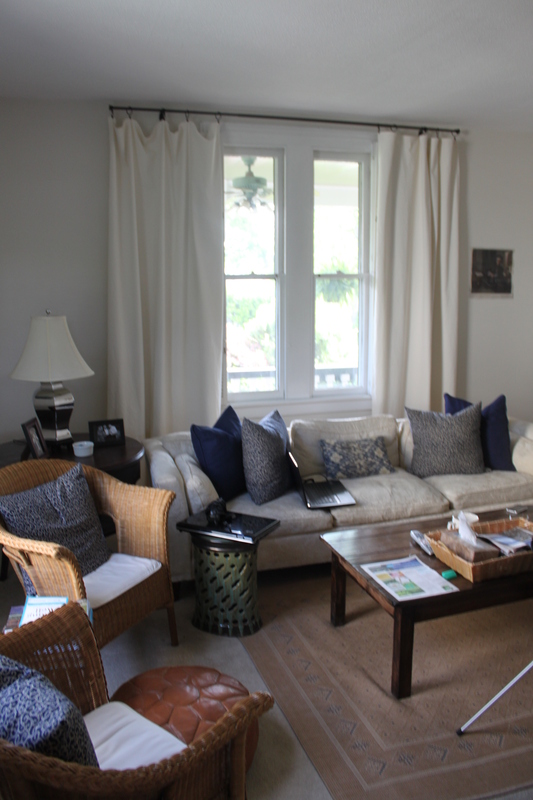 Take this room for instance (that I spotted in Elle Decor) that has somewhat of a similar theme as mine: white(ish) sofa, big blue pillows, metallic lamp, white walls, camel-colored accents, and wicker chairs. I love how the curtains help draw the eye up and fill in some of the vertical space without adding any heaviness or noise to the room. So, that’s what we went for. Also, please note, in the interest of keeping it real, I did not clean up before taking these pictures, so what you see if what our house looks like on a day-to-day basis. Complete with Ryan’s golf clubs in the foreground. I don’t know if it’s the most dramatic change ever, but for under 100 bucks, it’s a nice improvement! I’m also looking at getting a big planter and little tree to go in the back right corner of the room. 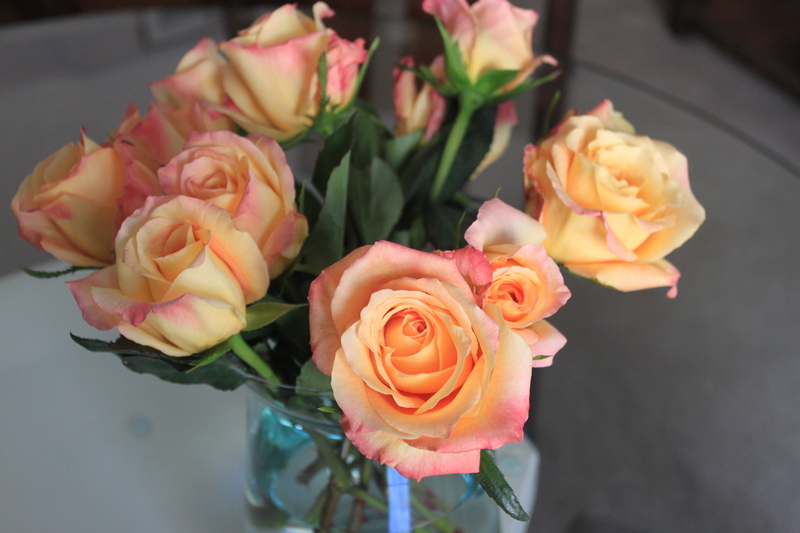 And, I couldn’t end this post without showing a pic of the beautiful roses my sweet husband brought home for me! Have a great week everyone!